Image caption Ayatollah Ali Khamenei said European powers should "avoid intruding into our defensive affairs"
The supreme leader of Iran has defended the 2015 nuclear deal and used strong language to accuse US President Donald Trump of ranting and lying. "I don't want to waste time on answering the rants and whoppers of the brute US president," Ayatollah Ali Khamenei said. Mr Trump has refused to certify to the US Congress that Iran is complying with the terms of the deal. He has threatened to terminate the Obama-era agreement altogether. The American leader called for the deal to be amended to prevent Iran from developing nuclear weapons or intercontinental ballistic missiles. Ayatollah Khamenei said he welcomed expressions of support for the accord from European states but if the US tore up the deal, Iran would "shred it to bits". 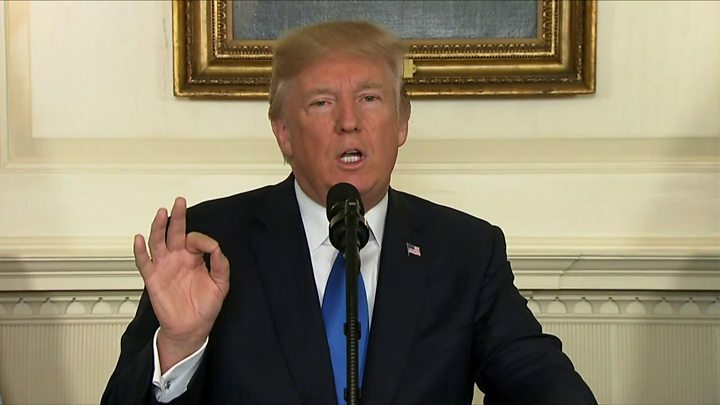 President Trump also accused Iran of "destabilising activities" in Syria, Yemen and Iraq, and imposed sanctions on the powerful Islamic Revolution Guards Corps. Congress must now decide whether to reimpose some economic sanctions that were lifted as part of the nuclear deal in return for Iran limiting sensitive nuclear activities. If that were to happen, the US would in effect be in violation of the terms. 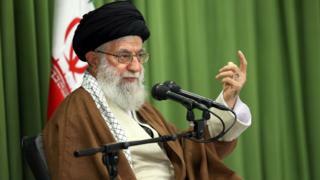 Iran says it has the right to nuclear energy and insists its nuclear programme is for peaceful purposes only. On Wednesday, an Twitter account attributed to Ayatollah Khamenei quoted him as telling students in Tehran that it was a "waste of time for anyone to answer" Mr Trump. He said Mr Trump was "mad" because Iran was spoiling US "plots" in Lebanon, Syria, Iraq and Egypt, according to an account of the meeting with the students that was posted on his official website. "If they ask questions like, 'Why Iran is active in the region? ', well, it is none of their business," he said. "Or if they ask, 'Why does Iran have missiles?' then our response is, 'Why do they have missiles and nuclear weapons?'" He called on Europe to actively oppose Mr Trump's position. 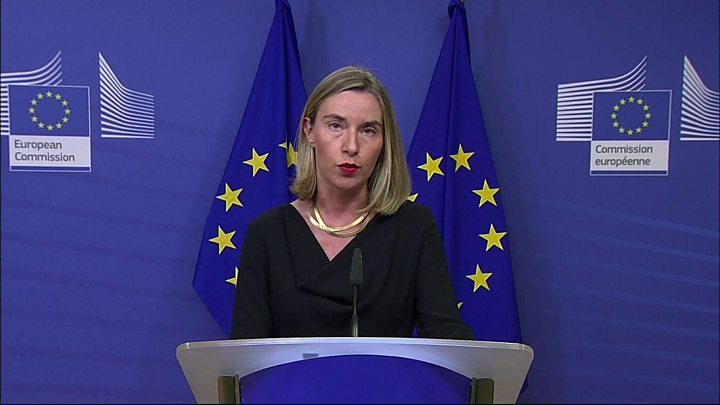 The UK, France, Germany, Russia, China and the EU all endorsed the agreement. The US says Iran has carried out ballistic missile tests in violation of a UN Security Council resolution that endorsed the nuclear deal. It has called upon the Islamic Republic not to "undertake any activity related to ballistic missiles designed to be capable of delivering nuclear weapons". Iran says the missiles it has tested are not designed to carry nuclear warheads. What do Trump's words on Iran mean for US/UK relations?